Extraordinary times require extraordinary solutions. And perhaps no other undertaking gives a window into how visionaries are approaching the business challenges of our era than PricewaterhouseCooper’s annual CEO Survey. With findings launched recently at the World Economic Forum in Davos, the analysis surveyed 1,322 business leaders across 77 countries in an effort to gain greater understanding of how businesses are determining a course for growth. Levi’s Chip Bergh was one of 28 US CEOs selected to be interviewed in detail for the study, segments of which were aired throughout the week in Davos. Bergh fielded topics ranging from the state of the international economy to future technologies to which qualities make a great leader. Who do you think your competitors will be in the future? For example, in a couple of stores, we’ve got a tailor shop where you can get bespoke Levi’s custom-tailored for you. You’ve got to give consumers a reason to walk into your store, because if you don’t, they’re going to buy online. As you look at other industries, what is interesting in terms of disruptions, and what do you learn from those? Think about how smartphone technology in general has changed our lives. Not too far in the future, you’re going to be able to take a panoramic picture of yourself as you spin your body around, and we’re going to be able to custom-tailor a pair of jeans for you, one unit at a time. That’s amazing, and it will completely change everything when that capability comes along. How do you think about talent diversity and inclusion in terms of culture and competition? I believe a diverse workforce will outperform a homogenous workforce any day. As we’ve rebuilt the organization since I got here, I’m building a diverse top team, as well as a diverse organization. We operate in a global world, and our business is global. We need a workforce that represents the consumers who buy our product. What is the key attribute you think leaders need to be successful? I can’t make this company great without great leaders underneath me. Do they value talent? Can they mentor people? Can they select great talent to work for them? Are they not afraid to make the tough call? Are they able to fly at 40,000 feet, but then when they need to, get into the mud? Can they move around the world and be sensitive to the different cultural dynamics, and sensitive to different consumer needs? It’s the ability to manage complexity yet make things simple, the ability to sort through the chaff and focus and prioritize—so that their organization can prioritize. At the end of the day, that’s what it’s about. Here is a direct link to the complete interview and video of it. 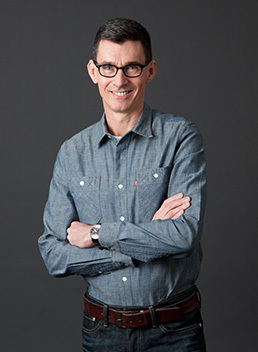 Chip Bergh is the President and Chief Executive Officer (CEO) of Levi Strauss & Co, a leading global apparel and consumer goods company with sales in more than 110 countries. Hde is a strategic leader with a proven ability to build and grow brand powerhouses, bring new products to the mass market, develop innovative marketing campaigns, and capitalize on digital platforms to drive brand awareness. Prior to joining Levi Strauss & Co, Chip was Group President, Global Male Grooming, for The Procter & Gamble Company (P&G). During his twenty-eight year career at P&G, he served in a number of leadership positions with increasing levels of complexity and scope. In his role as Group President, Global Male Grooming, he was responsible for all aspects of branding, innovation and key investment decisions of the $7 billion global business. In this role, he also led the global expansion of Gillette Fusion to more than 80 markets outside of North America, building a $2 billion brand. Additionally, he was the driving force of a number of successful product launches and multi- platform marketing campaigns. He has led multiple acquisitions and completed an extended tenure in Asia where he led expansion strategies in a number of emerging markets. Chip previously served on the Board of Directors for VF Corporation and on the Economic Development Board, Singapore. He was also a member of the US-ASEAN Business Council, Singapore. Robert – Levi’s $1000 bespoke jeans reminds me of Kodak’s foray into digital imaging. It didn’t work then and seems as unlikely to work now. By the time the price of CCD came down to the point where it would work for Kodak, Nikon and Canon already had the business “sewed up” – because they were able to figure out and eliminate the “pain points” of using film (the elimination of which people were more than happy to trade for Kodak’s clarity and resolution). The guy from P&G will take them down this very same road. Too bad.